For samples that are 10 stitches. Operation starts with the third loop, leaving two for lifting. We introduce the hook in the loop and stretch it through the working thread. Whereupon the loop is passed through the loop, located on the hook. Likewise provyazyvayutsya all tabs to the end of a number of. After that, the work is turned, in the beginning of the series once again recruited the lifting loop and knitting continues along the same lines. to give the product a finished look and handle it by the edges. In circuits connecting bar or polustolbik typically denoted by the symbol point, or round tick, downcast. Hooked to the first loop thread working throws. In the early number of the hook is inserted into the third loop, and then each following and a new loop is pulled. After that the working thread is grasped and provyazyvaetsya three loops formed on the hook. Hook enter in the loop of the previous row and pull the thread through it. Eagle Eye obtain two loops. Then skip through the worker thread formed two loops on the hook must be again, resulting in a new loop and vyvyazanny column. The yarn is drawn through the two walls of the previous row loop. Capture crochet thread made of the rear wall. The hook is introduced into the loop, located on a number below. Loop is knitted through the front wall. When knitting circle column without nakida can be created by inserting a hook into the bridge between the loop of the previous row. On the hook to the first loop of three throws lifting thread. After that, from the fourth eyelet from the start knitting the new loop is pulled. Then the worker thread is captured again and gently pulled through all three, formed on the hook tabs. When knitwear columns with two sc in the beginning of the series is four lifting loops. Then the hook loop with air working thread throw twice, to form two nakida. In the next step of the first series of loops pulled thread work. In this way, on the hook to get four tabs. Working thread again jumped on the hook and extends only through the first two loops, are on the hook, and the rest are also not knit. After that the working thread again jumped on the hook and again provyazyvaetsya two first tabs. The last step through the remaining two loops on the hook again drawn thread work to form a new loop. 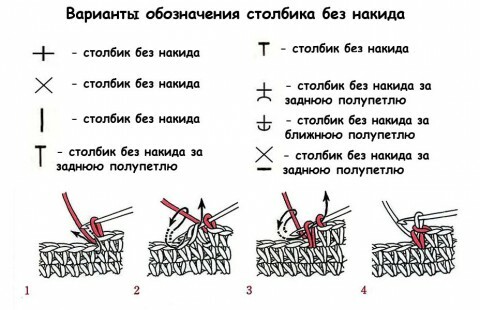 Columns with a large number sc provyazyvayutsya the same technology, pairwise knitting stitches, as the post with two sc, and the more nakida, the higher the bar is a ready. Such columns typically used to perform complex open-work patterns, as well as the need to make the addition of the number of loops in the web. facial, disposed before work or convex. purl, located at work or concave. 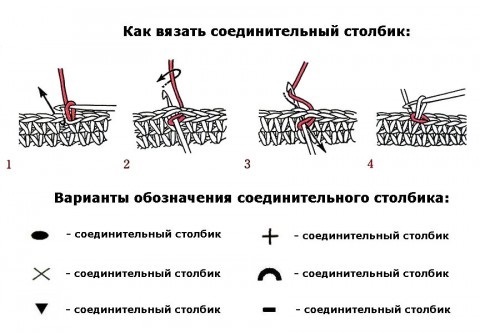 A distinctive feature is the relief columns, that they do not begin to make a chain of air loops, and perform only after provyazyvaniya at least one row of columns with simple or sc. 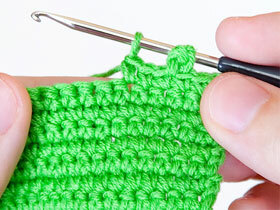 Consider in turn how to knit convex and concave bar. In each new row, first to lift the aircraft make three loops. Then, the hook and sc administered in the second column of the previous row, so he was on top of the hook. We are pulling the thread work and perform all operations as if knitting a simple column with a single sc. 2. concave postik It is a bit more complicated. For him, all actions are performed in the same way, as well as for personal relief column, but when pulling the thread hook is introduced into the second loop so close previous, that she was under the hook . This is done as follows: the hook is inserted for the web and covers the previous loop from left to right and working the thread is pulled through the loop on the wrong side. If desired, the fabric can be knit a concave or convex bumps, then it will turn out the same on both sides, or alternate, alternately provyazyvaya their ranks, In this case, the front side of the product will smooth, Wrong and how to rib. Also raised columns tally with one sc, but in this case also provyazyvaetsya column in two stages by two tabs. At the beginning of each row is knitted five lifting loops. On the hook to the first loop is nakida, then from the first loop, the previous number of the new loop is pulled. Moreover, its height should be equal to the height of the column with sc. The action is repeated twice. Then hooked again throws a working thread and extends seven loops, formed via the previous operations. Then one air loop is knitted, and the next column is knitted not the next loop of the previous row, and after one. Crossed columns, you can create as a whole cloth, and is knitted them in more complex patterns. Most of these columns are labeled with an icon, having the form of two crossed rods. At the beginning of each row makes four loops rise. On the hook twice snapped a working thread (We make two sc). Working thread is pulled from the first series of the main loop. After that you need to knit the first two loops, are on the hook, as a result, actions done on it is three loops. Again done nakida, then a loop is introduced through one hook and a new loop is drawn. In the next step provyazyvayutsya together the first two loops on hook. Then the working yarn again jumped on the hook and again extends only through the two loops. In this way, on the hook again remains one loop. She rises from one air loop, We do sc and enter hook in place, which intersect vyvyazannye columns with sc and pull the third loop. Provyazyvaem loop and sc together, then again throws the thread on the hook and pull it through the remaining two loops. The second column starts interbreed provyazyvatsya in next st series. In this way, learning how to do all of the above columns, everyone can associate yourself at least a couple of interesting veshchichek.